A category is a collection of URLs, domains, phrases, lists of file types, security rules, or any combination of these. The Smoothwall comes installed with a range of Standard Categories. You can define new categories of content for use in web filter policies to suit your organizations needs. 1. Go to Guardian > Policy objects > Categories. • Name — The name of the category. • Comment — Enter an optional description for this category. • Tenant — Optionally, select which tenants use this category. Specifying the tenant enables your Smoothwall to apply network and web filtering permissions to users coming from different tenants with usernames which are the same. 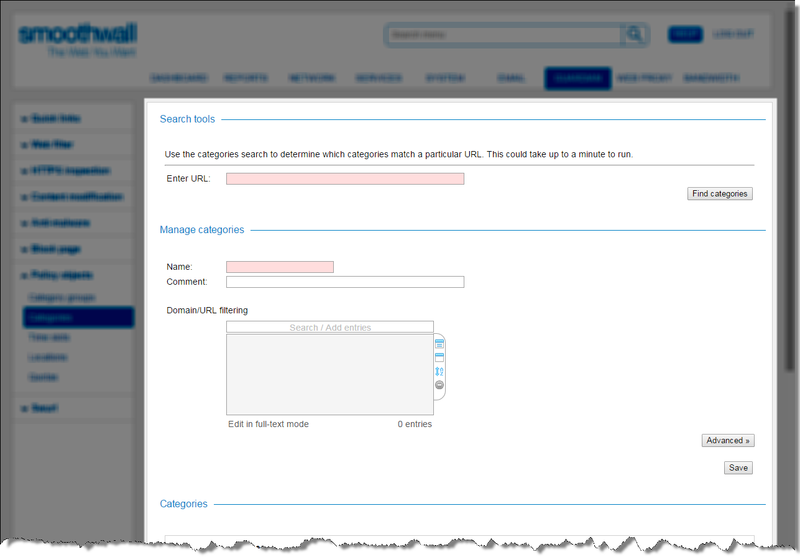 • Domain/URL filtering — Enter the domains and or URLs for this category. Only one entry is allowed per line. Note that www. is not needed for URLs. Spaces before and after a term are not removed, thus simplifying searching for whole words. The example above looks for URLs containing either the word adultsite or the word sexdream. Note: Avoid the use of unnecessary parentheses. In particular, avoid using (. )* as this can use up a lot of memory. • File extensions — Enter one file extension per line. You must include the dot (.) when entering file extensions, for example, .doc. Guardian creates the content category and makes it available on the Guardian > Policy objects > Category groups page. 2. From the Categories panel, click for the relevant category. Guardian displays the category in the Manage categories panel. Note: If you are using a Multi-Tenant configuration, you cannot change the tenant assigned to a category, as that category may form part of a category group or policy which is tenant-specific. Note: You cannot delete a category if it is in use in a policy. You must first remove the category from the policy.